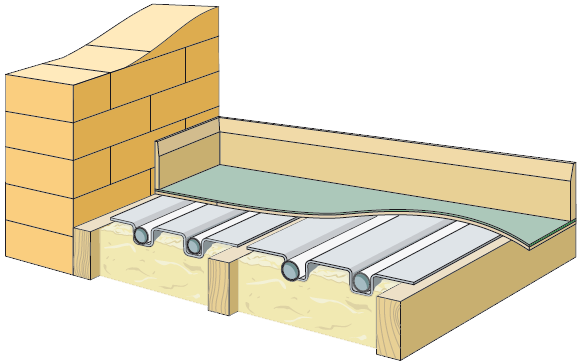 Typical ground floor installation is made up with a sub floor then 100mm of insulation like Celotex GA400 were we install the underfloor heating using clips or plastic bars that can be installed into the insulation. Once the underfloor heating is laid then there is a screed floor laid on top. 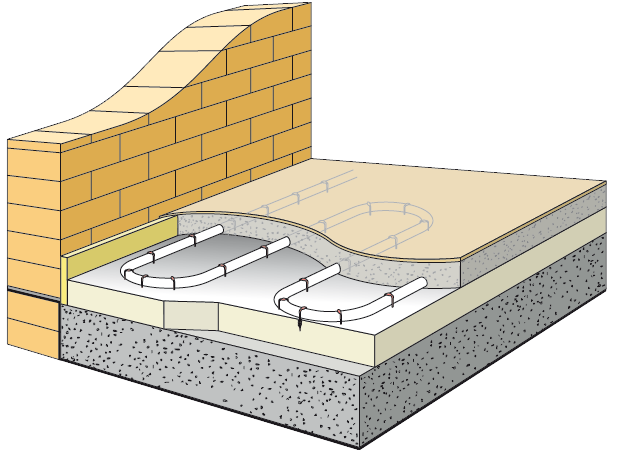 The typical screeds are 75mm but some reinforced liquid screeds can get down to 30mm. Advantages of this type of floor is high output at up to 100 watts per meter with suitable floor covering. Disadvantage is that the floor is slow to heat up and cool down so there can be over heating in the spring and Autumn. This is typically found on 1st floor or above were we are installing Underfloor heating between joists. 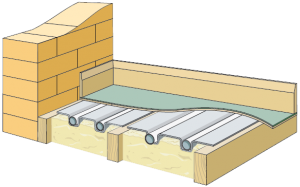 The typical make up is 50mm of Celotex GA400 or equivalent otherwise you fill the joist with mineral wool. Then there is aluminum plates. The pipes are then laid into the groves of the plates. Advantages of this system is that the floor has a quick response time so you do not get overheating or long heat up times. 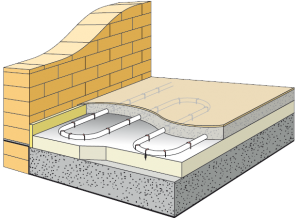 Disadvantages is lower output and often it is not suitable to lay thick carpets onto the floor unless you have a super insulated house. Advantage of this system quick response time and avoids costly digging out of the floor. Disadvantages is lower output and that you need to cut down doors and raise skirting board heights.